How to plan an SEO strategy that always works? As inbound marketers, we always look for the best SEO strategies to put into place in order to generate the maximum ROI for our clients. Some strategies fail while others give us excellent results. What is common in all those winning strategies that can be applied to each and every site so as to get a formula for SEO success? Well, in this post, I will present my thoughts on planning a successful SEO strategy by carefully implementing 7 steps. Every business thrives on certain objectives. As internet marketers and search engine optimizers, our only purpose is not only to understand how search engine works, but also to understand what the business owner expects from our work. The measurement of success can be different for different business owners. Hence, it becomes necessary to identify the business objectives and derive proper KPI (Key Performance Indicators) before any SEO strategy is planned. Here are a few example objectives and their corresponding KPI’s. comments, likes on brand's social profiles etc. As the table above suggests, it is important to determine the KPI’s before you actually start planning your main strategies. Although the above KPI’s are simple but they can be changed as per the exact needs of the business. I would recommend having a read at this excellent KPI tutorial from Avinash Kaushik to have a deep dive in the world of KPI’s. Before you start working on any site, make sure to perform a complete analysis of links it already has. Many times business owners fall in the trap of buying low quality and cheap link building packages without even knowing that these sort of unnatural links can be disastrous for the online visibility of their site. A thorough link audit will disclose any unnatural links pointing to the site that might hurt the site in the long run. Also, make sure to check the GWT (Google Webmasters Tools) for any manual link building penalty which Google might have applied on the site. A- Whether the link is unnatural or natural (this is tricky and requires manual review even though you can take help of tools like link detox to make it easier). 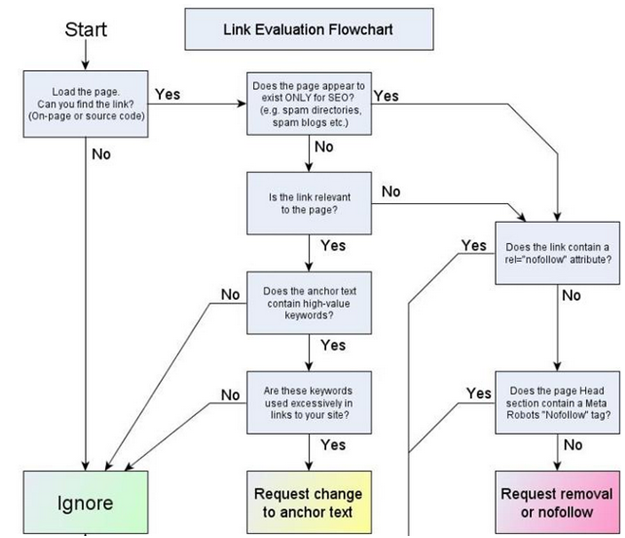 Have a look at the below chart for determining the intent of the link. A- The DA/PR of the site providing the link. B- The anchor text in order to determine the percentage of exact match anchor texts. A chart must be prepared that clearly mentions the ratio of natural vs. unnatural links. This can help to take faster and accurate decisions. A- Site should be redirected properly. There should not be any canonicalization issues. For more help, see Matt Cutts advice here. B- Design should be responsive and mobile friendly. (The world is going mobile; you need to be prepared for it). See recommendations for building Smartphone optimized sites. C- 404 errors should be located and fixed. See Google’s advice here. D- Proper sitemaps should be provided. Both sitemap.xml (for the search engines) and sitemap.html (for the user) should be present on the site. Have a look at Google’s suggestion on sitemaps. F- Proper internal links with appropriate natural anchor text should be used. I recommend to read John Doherty’s post on smarter internal linking. G- A correct robots.txt should be specified. Check out Moz’s cheat sheet on robots.txt. H- The images used should be properly optimized. Have a look at this excellent guide from Neil Patel to learn the secrets of image optimization. I- The main KPI improving design elements are used in the appropriate place where there are chances of maximum conversion. For this, you may take help of In-page analytics in GA. Thanks to the Panda update, site content needs to be more user friendly and less keyword stuffed. Content is the main fulcrum around which the user rotates, it needs to be comprehensive and problem solving. Remember, every user uses search engines in order to resolve their queries which can be transactional, navigational and informational. As an SEO, you must think from user point of view and ask yourself, “Does the content specifically answer what the user demands?” and “Will the user engage with the content?” If the answers are NO, content enhancement and seo copywriting is needed. C- It should be comprehensive with proper images, videos and interactive elements. D- It should be written keeping in mind the targeted audience. E- The site should not have empty content pages or low quality content pages. F- Every page should serve a purpose and the content should be focused around that purpose. G- Use of H1, bold and italics should be taken care of. H- Technical factors like TF-IDF score and semantic relevancy should be analyzed properly. For more help, I would recommend reading the Moz tutorial on how usability, user experience and content affect search engine rankings. In 2014 and ahead, the biggest factor that will impact rankings is “user engagement”. You need to prepare strategies to transform a website from a lone web property to abrand. Brands have the power of drive user engagement in the form of comments, mentions, links, social shares etc. All these factors are important and counted by Google in its ranking algorithm. (See- Why reputation and branding matters in seo). A- Build up your site in a manner your targeted customers would love to see it. B- Add each and every element that will hold the visitors on the site. Innovative thinking is the key here. C- Matt Cutts had pointed out earlier in an interview published in Wired "And we actually came up with a classifier to say, okay, IRS or Wikipedia or New York Times is over on this side, and the low-quality sites are over on this side. And you can really see mathematical reasons." This hints towards brand popularity and authenticity. Ask yourself; “is your brand popular enough to be listed on Wikipedia” or “newsworthy enough to be covered by the NYT?” The strategies you plan for your brand promotion will directly impact the future scope of your brand being listed on these high trusted seeds. D- Get your brand listed on notable sites that rank high on Google for brand related queries. Some of the essential ones are Wikipedia (you will need references and citations to get listed here), Facebook, Twitter, LinkedIn, YouTube, Flickr, Google Plus, CrunchBase, Pinterest etc. Once you get your brand listed here, work towards building a healthy relationship with your customers. This will help to build up the reputation of your brand. E- Invest some time and money in creating stuffs that are link worthy. In Seo terminology, we call these as “link baits”. The maximum number of link baits you have in your site, the higher would be the chances of receiving natural backlinks. But, hold on as link baits have become more common, people have started creating bad link baits that do not pay up in the long run. Creating sustainable and effective link baits takes creative thinking and time. Hats off to Cyrus Shepherd for creating this excellent post mentioning the ineffectiveness of bad link baits and the worth of good linkable assets. F- Have a PR department or outsource one that will do the job of identifying channels that can generate the maximum publicity for the brand. The PR personnel will help in maintaining relationships with other PR personnel who cover your industry based NEWS on a regular basis and therefore provide ample opportunities for your brand promotion. These things don’t have overnight so don’t expect immediate results. Build and solidify your networks and everything will fall into place gradually. To get a head start, read this useful post from Samuel Scott regarding how to frame a proper PR strategy. G- Social media is the brand’s report card. How well a particular brand is performing online is measured by the amount of engagement it is able to drive on its social channels. Yes, there are certain exceptions to it but I have seen this happen most of the times. Hence, it becomes necessary for the brand to build up rapport with the users on each and every social channel that might help the brand in some way or the other. As said before, user engagement is a vital factor which Google is counting upon and in future too many algorithmic changes are expected to judge and refine the level of user engagement any brand is able to generate. H- Ensure that your brand is receiving citations online by the activities your brand is participating in either online or offline. Citations are also a measure to track the popularity of a brand. I- Make use of tools like Hubspot, SocialMention or Google Alerts that allows you to track brand mentions whenever they happen. Identify the people who are already covering your brand and thank them for this. Get the engagements going and you never know this can generate word of mouth promotion for your brand. J- Email marketing, print advertising, TV commercials, billboards, direct mails all play an important role in building up a brand so do not ignore the other advertisement channels simply because you want to grow online. This is the biggest mistake which most of the small and medium sized organizations make while planning their online marketing strategy. A successful online marketing strategy will have place for offline marketing aswell. Businesses need to revolutionize themselves as per the user behavior and future market potentials. Ask yourself “Is your brand taking the right step towards advancement in an innovative manner?” Think and research on the products and services that your competitors are building and identify what difference in value, price or uniqueness you offer to your customers? If the same product is sold in a different packet chances are people will ignore it soon. Innovation is the healthiest part of the competition and I simply love it as a consumer. A- Have a mobile site or a responsive site. Smartphone are increasing at a rate that you can hardly imagine. Within years from now, every SEO strategy would be build around mobile phones and not desktops. Are you prepared for it? Take a look at this tutorial mentioning 14 changes you need to make in your site today to make it mobile optimized. C- Rich snippets are the current and future snippets. We can also expect dynamic rich snippets in future (Did Google just stole my idea?). If the site you are promoting does not offer interesting stuff that can be highlighted on an SERP, why would the user click on it? Rich snippets come in various types and it is highly recommended to use them on every site. This is what I mean by advancement. # Cost and ROI may vary depending on the business type. Every business has its own competitors. It is important to check the current SEO status of the chosen competitor and compare it with the brand to be promoted. Comparison should be done on various levels. A thorough and practical comparison can give us some vital stats and standards that we need to set up prior to start any campaign. Also, the analysis should be done on a continuous basis instead of planning it right before the start of any campaign. Performing it at regular intervals can give you insights regarding your progress and your competitor’s progress. This sort of healthy competition analysis gives more reasons and scope for improvement. Now, let us look at the table below that focuses on two levels of competitor analysis which must be carried on during the entire phase of any SEO campaign. Check the rankings of your competitor on different search engines for the chosen keywords. Check the technical seo issues like meta tags, canonical tags, domain name, redirection, robots.txt, sitemaps, navigation structure, internal linking, finding DA, PR etc. Analyze the content quality on a high level using metrics like TF-IDF score and semantic analysis. Compare the recent and past traffic trends of the site using tools like Alexa and Semrush. Perform a complete link analysis and check the quality of links pointing to the site. It is important to identify the natural and high authority links. Analyze the depth of social media presence of the competitor on sites like Twitter, Facebook, LinkedIn, Pinterest, Google Plus etc. With tools such as Google alerts and socialmention, identify the brand mentions, links, likes, tweets etc that the brand is able to generate on a regular basis and plan your efforts accordingly. Repeat the steps you did at level 1 and compare your success so far. Determine if the growth is positive or negative. There should not be a large difference between your competitors graph and your site's graph. If it is totally negative, find out the reasons why that happened and try to revamp your current strategy. A strategy that you plan today might not be that effective years or even months from now. Hence, it is extremely important that you must monitor, test and reinvent your current seo strategy in order to remove the tasks that have become outdated and replace them with new tasks as per the algorithmic changes or the recent marketing trends. A- Keep an eye on the crawl errors under GWT. This is important because if at any point of time, Google is unable to crawl any webpages then you must see an instant notification here. Check the number of not found errors for desktop, Smartphone and feature phone. Every other strategy will fall into place only after Google successfully crawls your site. B- Check the blocked URL column under Crawl section in GWT to identify there are no important URL’s that have been blocked accidently because this may affect the performance of the entire site. C- Test that the sitemaps are working and are regularly updated. D- Monitor the search queries that are bringing in traffic to your site and make sure to download the search query data every month because Google by default displays only 3 months of data. If you wish to check the search queries for the more than 3 months, there is no way to do that. Hence, it is important that you download the data and keep it for your future reference. E- Check the links to your site section under GWT and keep a track on the number of links that are pointing to the site. Keep an eye on the anchor text and the top domains that link to your site. F- Check the manual action penalty tab on a regular basis and before the start of any new campaign in order to identify whether any manual action penalty has been applied by Google. G- Allow Google to email any major site issues to your email id. You can enable the email notifications tab under the Webmaster Tools Preferences located under the admin section. A- Identify the top channels that are sending traffic to your site by moving to the “channels” tab under “Acquisition” section. B- Track the amount of new visitors that are visiting the site using mobile devices. You can find the stats in the “devices” tab in the mobile section. C- Check the page speed suggestions column under the “site suggestion” tab in the “Behavior” section. Page speed is an important factor and should not be ignored. D- Check the in-page analytics section and identify the top areas where users are clicking on the site. Adjust the highly converting elements as per the pre-determined KPI’s where the users click the most keeping in mind the overall user behavior. This can really help in increasing the conversion rate. E- Move to the “site search” column to identify the products or keywords that the users are most interested in when they come to your site. In order to provide a seamless user experience, your site must serve all the relevant demands of the user. Testing is an important phase of the overall SEO campaign because it reveals the actual user behavior and distinguishes between what is thought to be a success and what is actually a success. A/B Testing - In almost every phase of your SEO process, you must not forget one thing and that is the KPI's. After all this is what you are running the campaign for. A/B testing in Google Analytics allows you to test two different versions of the conversion page in order to find out which page performs better and leads to more conversions. This helps to put the best page in the site and achieve greater ROI. Multivariate Testing - This type of testing goes a level deeper than A/B testing and allows you to test the performance of the various elements in a particular web page as opposed to two separate web pages as in A/B testing. Multivariate testing is beneficial in finding which design or content element is playing a major role in conversions. You can create content experiments in Google Analytics to test the effectiveness of your landing pages. Remember, traffic that does not lead to conversions is equal to NULL traffic. Experimenting is a great way to ensure the traffic the site is getting is not leading to drop outs but instead contributing towards fruitful conversions. No strategy can remain stable for a long period of time. A constant strategy becomes stale sooner or later. Hence, in order to keep your SEO strategy return results, it is important to reinvent it for its betterment. Remember the 2nd level competitor analysis? May be you might need to reframe your strategy based on what your competitors are doing and what updates Google had recently. A successful seo strategy should be customized and innovative. Also, a word of caution here, do not rely on competitors completely because if they spam and you follow that strategy then a Google penalty is waiting for you. Hope you enjoyed reading this article. Let me know your thoughts and views in the comments below.